Israeli Occupation Forces (IOF) on Monday overnight arrested two minor sisters from Aida Refugee Camp next to the Israeli apartheid wall, south of Bethlehem, during their daily raid and arrest campaigns. According to the family, IOF stormed the home after breaking its main gate at 2:00 AM last night. Soldiers then asked the family members to gather in the living room, and asked for their ID cards. IOF then arrested the two sisters, Aseel Abu Aker (13 years old) and Nisreen Abu Aker (15 years old). While the family tried to make them stay because they were minors, soldiers refused and arrested the two girls taking them to an unknown destination. The family is currently trying to contact lawyers and Child Defense organizations. The sisters are daughters of the long term Palestinian prisoner, Bassam Abu Aker, who has been in administrative detention for a year now, and has spent and overall of 24 years in Israeli jails through his life. In addition, IOF arrested 24 Palestinians during their night raids in different areas on the West Bank. In Bethlehem, local sources said in the village of Teqou’a to the east of the city, arrested a man after raiding his home. 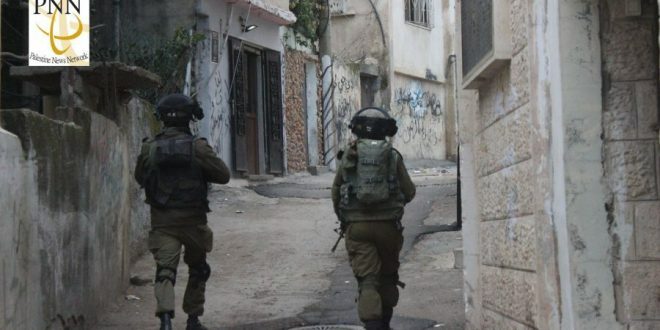 IOF also carried out raids and searches in a number of villages in Ramallah, where a number of citizens were arrested from the villages; Beit Rima and Deir Abu Mashaal. In occupied Jerusalem, IOF arrested three citizens from Anata town, while they arrested two youths from Hebron. Finally, IOF arrested two youths from Jayyus town in Qalqilya, northern West Bank.